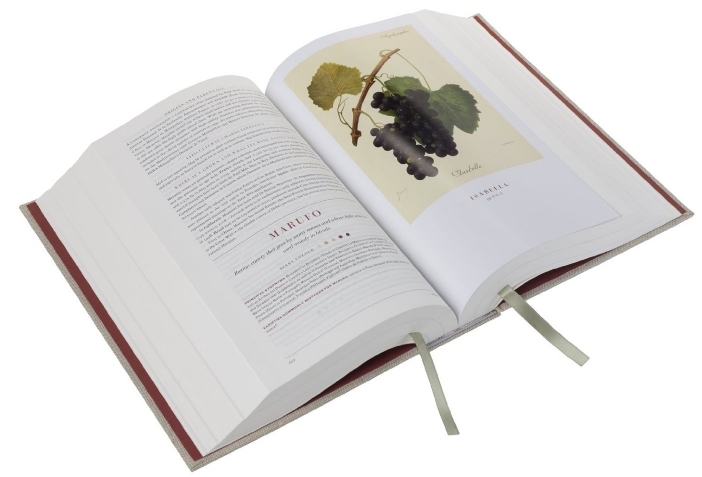 The full title is “Wine Grapes: A complete guide to 1,368 wine varieties including their origins and flavours”, by Jancis Robinson, Julia Harding and José Vouillamoz. For more information and a peak inside, see the winegrapes.org. Don’t worry about the RRP of £120. It is still an expensive book, but I bought mine for under £64 including postage from UKPaperbackshop, who sell through Amazon. My immediate reaction on receiving the parcel was to be surprised at how light and modestly sized it was. Then I discovered why the book of well over 1,000 pages was so light. With the exception of the colour plates, which are cleverly and unobtrusively bound in, the paper used is thin and light. It is almost bible-like, which is perhaps quite fitting. I found the overall appearance quite beautiful. The typefaces have a classic feel to them, the relatively light weight makes the book easy to use, and the binding works with the paper quality to ensure the book will lie open at any page without any problem at all. Having enthused so much about the binding and typeface, I feel I need to point out a couple of glitches. Part of at least one grape pedigree diagram is illegible due to the binding. The problem is that the printing goes too far into the spine and it is absolutely impossible to open the book wide enough to make it all visible. All in all, it is a bit of a blow for those readers wanting to know the details of the pedigree of Briana, a “minor but usefully winter-hardy and increasingly popular American hybrid”, but I think I can live without it. (Update: The other pedigree diagrams affected by this problem are Pinot and Prior. All three are available here as PDFs.) Also, the font used for the grape variety name headers could do with some kerning. When I first saw the variety TAUBERSCHWARZ I was wondering if it was two words: TAUBERSCHW ARZ. In this blog, my browser does a lot better job of kerning the WA combination than the book. And while I am at it, I found a spelling mistake – grindchildren. Lest I risk of becoming the Craig Revel Horwood of wine book reviews, the design and attention to detail still gets a 10 from me! The style of writing is clear and authoritative, with a regular pattern followed throughout the book, nice use of fonts to add meaning, good lookups to access the information, and plenty of references to chase up if you want more. It is not designed and written to enthuse the casual reader – with the exception of the plates there are no pretty pictures, and no boxes on the page design to attract your attention and draw you in. But that is just the way I like it, and if you are not already eagerly seeking information about grapes it is unlikely you would come to this book anyway. I was especially pleased to see many varieties have a description of the taste of their wines. From a drinker’s perspective this must be the most important information, and in other wine grape books I have often felt short-changed when this is lacking. I just wonder how the tasting information was collated. Like many other things to do with book, it must have been a mammoth task. As to the quality of the information… who am I to comment? I am prepared to defer to the authors on that issue. I am convinced. This entry was posted in General and tagged book, review. Bookmark the permalink. I’m so glad you liked the book. Yes, it certainly was a lot of work -four years – but it’s a delight to read enthusiastic responses such as yours. I am pleased my enthusiasm comes through. I certainly AM enthusiastic, but after just having hit the publish button I was afraid it may have been hidden by the nit-picking. Thank you for the pedigree link. I shall also modify my post to include the link as I know not everyone sees the comments. Funnily enough, I can’t find the ‘grindchildren’ on any of those 1,240 pages. Could you kindly give me a clue as to its whereabouts? I was afraid you might ask that. It was in a brief comment in parentheses, and in a variety description towards the front of the book and on the left hand page. Not much use, eh? Let’s just say I’ll get back to you if I find it! ‘grindchild’ is in the Água Santa entry, to my dismay, having read the proofs 5 times! Nice to hear from you too, Julia. Congratulations to you Jancis and José on a great book. After all the hard work maybe the grind bit was a Freudian slip. Must admit that when I said “I can still see grindchildren in the book” it was really just a cheap jibe at printed media. I couldn’t see it after another skim through, so I am pleased to know I didn’t totally imagine it even if I got details wrong. Under Chardonnay you have listed that Auxerrois is both a synonym and a commonly mistaken variety. Under Auxerrois, Chardonnay is listed only as a commonly mistaken variety and you clearly explain that it is a sibling of Chardonnay. That was our query. I do hope I can explain in words that make sense. Auxerrois and Chardonnay are two separate varieties. By coincidence the name Auxerrois happens to be one of the synonyms for the Chardonnay variety. But that does not necessarily mean that Chardonnay would be a synonym for the Auxerrois variety. And it isn’t. [optional additional paragraph:] Auxerrois has its own identity and has never been called Chardonnay. It just so happens that in certain places and times Chardonnay has been known as Auxerrois, but now that Chardonnay is so world-famous, it is very rarely known as anything but Chardonnay. Do hope this is clear enough. I can see how the confusion arises. In normal usage, if A is synonymous with B, then B is synonymous with A.
I am not sure to what extent synonym has its own special meaning in the context of grape varieties, but perhaps it would be more accurate to say that Auxerrois is an alternative name for Chardonnay rather than a synonym.